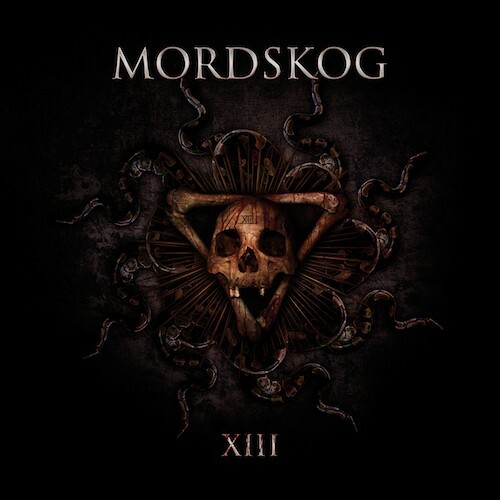 On January 6, Werewolf Records in cooperation with Hells Headbangers will release the debut album by a Mexico City black metal trio who call themselves Mordskog. The title of the album is a Roman numeral — XIII — and from that album we bring you the premiere of a hellish track called “Mors Est Vitae Essentia“. The riff is king on this song — or more accurately, the riffs are kings. Anchored by a driving drum rhythm and bursts of double-bass thunder (with nary a blast-beat to be heard), the song moves from one infectious piece of poisonous black guitar magic to another. It only takes one listen for the song to get stuck in your head. And although you wouldn’t call the song “atmospheric black metal”, it does indeed have an atmosphere as well as the ability to rock your skull — it creates a strong sense of reptilian power and menace, an aura of coiled, seething, death-dealing peril, due in part to the vocalist’s savage, rasping, bile-choked, yet decipherable, snarl. When the drums begin to boom and tumble, you also get the feeling that you have fallen across the path of a demonic cadre bound for war. Too clean to the degree that it lacks character. Personal opinion about the production, not the band.